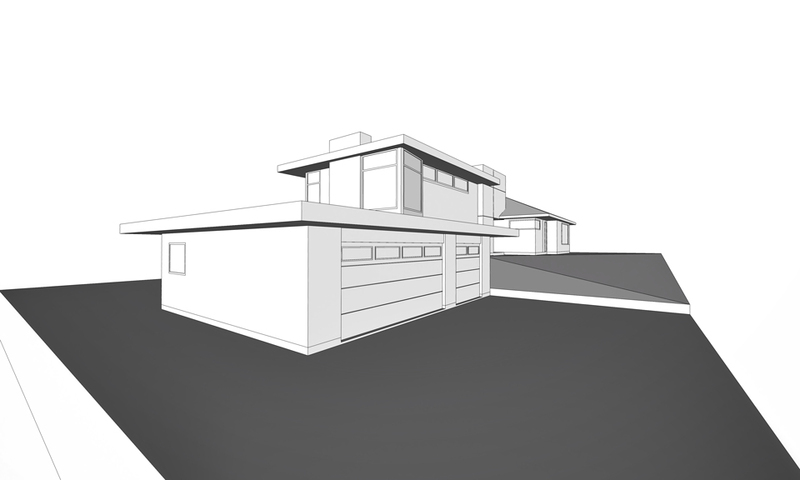 For this current project on the boards, a thorough schematic design process explored the architectural potential, both functionally and aesthetically, of a contemporary addition to a single family home in Fullerton, Orange County. A split-level floor plan provided the best opportunity to accommodate a new kitchen, living and dining area, with an additional garage below, allowing the new layout to take advantage of the sloping site while enabling an eclectic and unexpected elevation design. An expanded garage and workspace at the lower driveway incorporates double-sided roll-up doors for direct access to the rear yard, with a low flat roof that minimizes the garage massing to highlight the new, dynamic entry design and approach. The new configuration also provides for a raised nook at the rear of the kitchen, creating an intimate interior space with custom built-ins at the projecting windows and fireplace wall, framing views down the street and to the landscape at the rear. More to come as this project moves into construction documents.